Climate, fire and vegetation dynamics are often tightly coupled through time. 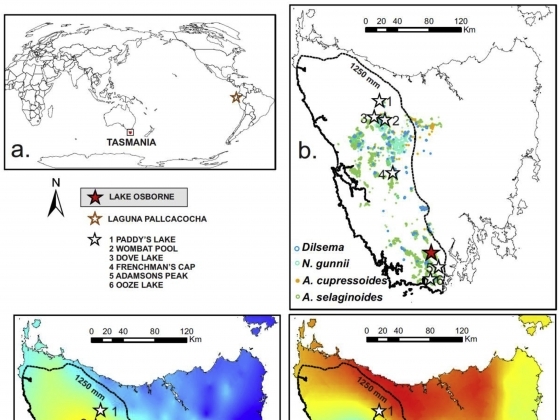 Here, we use a 14 kyr sedimentary charcoal and pollen record from Lake Osborne, Tasmania, Australia, to explore how this relationship changes under varying climatic regimes within a temperate rainforest ecosystem. Superposed epoch analysis reveals a significant relationship between fire and vegetation change throughout the Holocene at our site. Our data indicates an initial resilience of the rainforest system to fire under a stable cool and humid climate regime between ca. 12–9 ka. In contrast, fires that occurred after 6 ka, under an increasingly variable climate regime wrought by the onset of the El Niño-Southern Oscillation (ENSO), resulted in a series of changes within the local rainforest vegetation that culminated in the replacement of rainforest by fire-promoted Eucalypt forest. We suggest that an increasingly variable ENSO-influenced climate regime inhibited rainforest recovery from fire because of slower growth, reduced fecundity and increased fire frequency, thus contributing to the eventual collapse of the rainforest system.